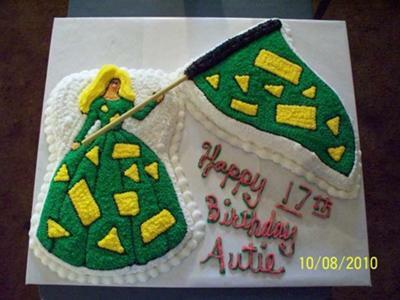 To make these flag line cakes, I used the Wilton pans, Barbie and the Pennant. I used 2 cake mixes and iced with stars in buttercreme. I did the odd shapes because my daughter is on flag line in band and these shapes are on their dresses and flags. The dresses and flags are actually black but I was NOT going to do the entire cakes in black so I used the other 2 colors also in their uniforms.